Hilton Head Island is one of the most bike-friendly communities in the nation, and it is a great way to explore the island. The town of Hilton Head Island is the only Gold-level community in the Southeast, according to the League of American Bicyclists. Miles of trails take you through wooded forests, along pristine beaches, and past historic sites. In all, Hilton Head Island features 60 miles of bike paths and 100 miles of protected public pathways. Learn more about our favorite bike trails on Hilton Head Island, with our guide to the 8 Best Hilton Head Island Bike Trails. The Sea Pines Bike Trails cover about 15 miles offering many points of interest along the way. The Sea Pines Plantation Golf Club, Harbour Town, Sea Pines Forest Preserve, and Stoney Baynard Ruins are just a few. Stop by the 4,000-year-old Sea Pines Shell Ring, listed on the National Register of Historic Places. Be mindful of walking trails, which do not allow bikes. Fish Haul Creek Park is just east of Michelville Beach and features 16 acres of land to explore. The Mitchell Freedom Park is a historic site in Fish Haul Creek. This park offers a shaded trail through maritime forest, wetlands, and marsh. There is also beach access from Fish Haul Creek. Jarvis Creek Park offers a 1.1-mile loop through wooded areas and marshes and along a small lake. The park sprawls over 53 acres and has a paved trail for easy access. The park also features outdoor training equipment, open grassy fields, fishing docks, and picnic pavilions. 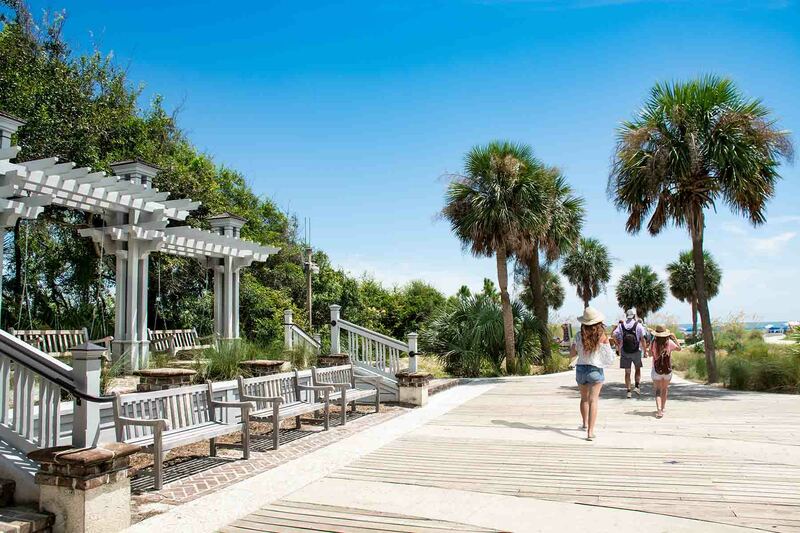 Coligny Beach Park is a favorite among locals and travelers alike. This modern and clean park features a wide-open boardwalk to meander and take in the views. Note that because this park is a favorite for many, it can get crowded during the busy season. There are on-site bike racks so you can hit up the beach without lugging your bike along. Greens Shell Community Park is listed in the National Register of Historic Places and features views of Skull Creek and Pinckney Island National Wildlife Refuge. It also offers picnic pavilions, a basketball court, and playground. Cruise through the wooded paths at Greens Shell. Bike to the Barker Field Observation Deck to watch a famous Hilton Head Island sunrise. The path leads cyclists behind Baker Field and to the Port Royal Sound. Go wildlife watching at Old House Creek Pier. It's a semi-secluded crabbing and fishing pier with views of the Intracostal Waterway. Shelter Cove Community Park is often host to live music and community festivals. Located along Broad Creek, Shelter Cove features a white granite memorial for veterans as well as sweeping views of the marshland. After a nice bike ride, you can stop by Shelter Cove Towne Center for some shopping and dining. Biking is a favorite pastime on Hilton Head Island. 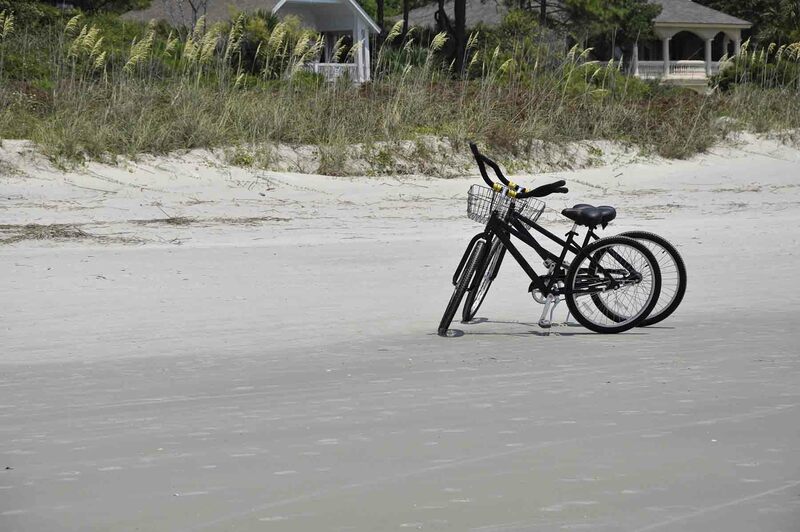 It's easy to get around on a bike from your Hilton Head Island vacation rental. 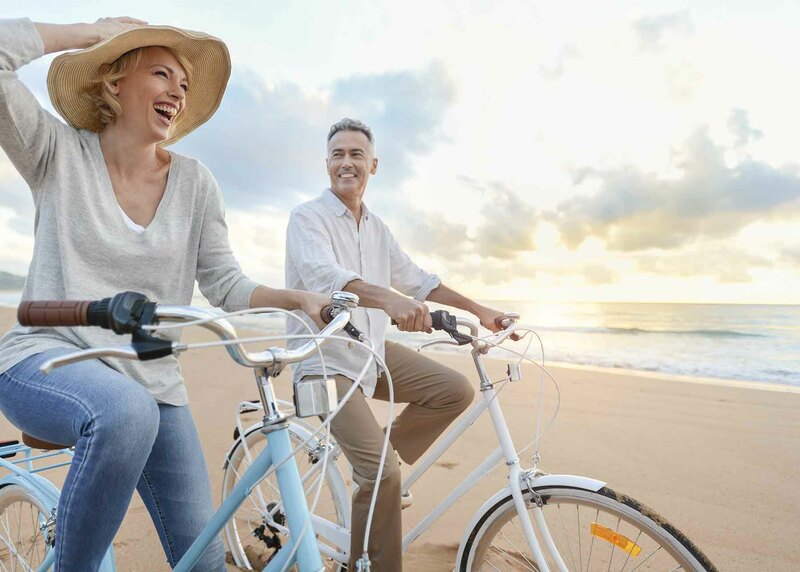 When you reserve your vacation rental with Hilton Head Vacation Rentals, you get access to our Southern Hospitality Pass with free bike rentals.